For 2019, Volvo takes the distinctive look of their larger SUVs and puts it into a smaller package called the Volvo XC40. 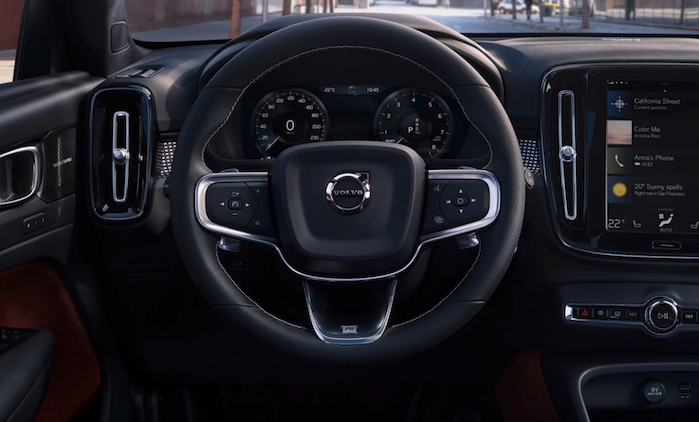 The 2019 Volvo XC40 is destined to make waves and not just in terms of its interior trim and complement of standard equipment. It comes with a 2.0-liter turbo engine making it a sporty performer. The 2019 Volvo XC40 is an all-new vehicle. Volvo’s newest entry competes in the competitive compact luxury segment with the BMW X1, Audi Q3, Acura RDX and Land Rover Range Rover Evoque. The 2019 Volvo XC40 T5 AWD R-Design trim ($37,700) comes with plenty of features like 19-inch wheels, a sport-tuned suspension, LED fog lights, a black roof, black exterior trim, keyless entry, a hands-free tailgate, dual-zone climate control, a cooled glovebox, steering-wheel-mounted shift paddles, front-seat extendable thigh cushions, a power passenger seat, leather upholstery with faux suede inserts, an auto-dimming rearview mirror, upgraded ambient lighting, and navigation. Other optional upgrades on this tester included heated front seats and steering wheel combo ($750), the Vision Package (41,100) added Blind Spot with Cross-traffic alert, Park Assist, and power retractable rearview mirrors. The Advanced Package ($995) adds 360-degree surround view LED headlights and headlight cleaning system. Other extras included a panoramic sunroof, 20-inch double-spoke matt-black wheels, Harman Kardon premium sound. The Premium package ($900) completes the full luxury experience with adaptive cruise control, wireless charging, a power passenger seat and power-folding rear seats. Total MSRP including destination: $45,835. Stepping inside the XC40 reveals a cabin very similar to its stablemate XC60. The steering w, eel, touchscreen and center stack design are smaller versions of what’s in the XC60. The front seats are perfectly shaped for long commutes and remain comfortable without leaving you tired after a long day. The cabin is chocked full of luxury items from leather seating to heated seats and steering wheel. The only thing missing in this luxury compact is a head-up display. The interior is a comfortable place to spend time and shuts out the busy world with a quiet serene cabin. The cabin has a cocoon-like quality, with glass that tilts inward and a laid-back center console. The serenity is heightened by the absence of knobs and buttons. Passengers in the back enjoy a surprising amount of headroom and legroom for a compact SUV. A removable cargo floor partition helps make the most of the smallish cargo area, and a cargo cover keeps items out of sight. The rear seatbacks fold down easily and the power liftgate made for easy loading of cargo this week. The XC40 is powered by a 2.0-liter turbocharged direct-injection four-cylinder engine producing 248 horsepower and 258 lb-ft of torque. It’s mated with an 8-speed automatic with stop-start technology sending power to all four wheels. According to EPA fuel mileage estimates, the 2019 XC40 will achieve 23/31 mpg city/highway and 26 combined mpg in its T5 all-wheel-drive trim. We found the XC40’s 2.0-liter turbo engine has plenty of power on tap for all driving situations you'll encounter. We drove the new compact Volvo at altitude in the rarefied Colorado air and it had was a joy to drive in the mountains. We pushed the XC40 hard up I-70 and we never felt we needed more power. We weren’t impressed with the stop-start system, but we’ve never tested a vehicle within that has a smooth transition. What we didn’t like was the clumsy shifter in the XC40 that kept us trying to find reverse or drive mode. Once we got it in gear, the 8-speed automatic shifts are quick and smooth and steering wheel paddle shifters give an extra sporty feel for those who like to manually shift. Around the tight contain curves west of Denver, the R-Design suspension kept us planted to the road and gives the driver confidence. Even with the optional 20-inch tires and the sporty suspension tuning, the XC40 is surprisingly comfortable even on uneven pavement. Visibility is somewhat limited due to the roof line kicking up towards the rear of the car, but the rear-view camera and extra rear sensors make for easier parking in tight spots. 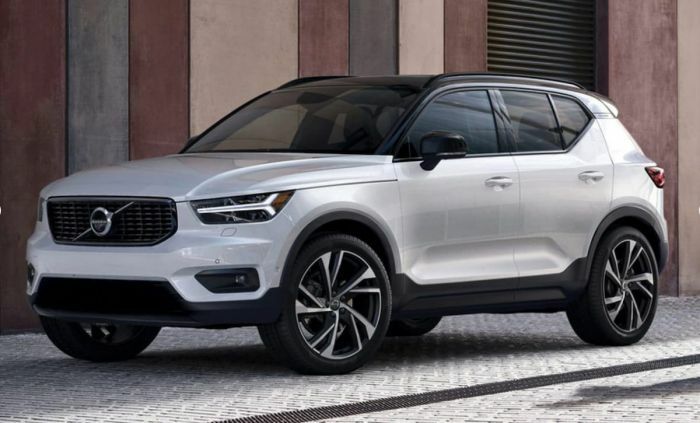 The all-new 2019 Volvo XC40 T5 AWD R-Design offers compact luxury buyers a comfortable cabin that's loaded with technology, offers the latest safety equipment with a collision-avoidance system that can detect pedestrians, cyclists, other vehicles, and even large animals. It offers one of the most efficient powertrains in this segment and comes with all-wheel-drive for all-weather capability.